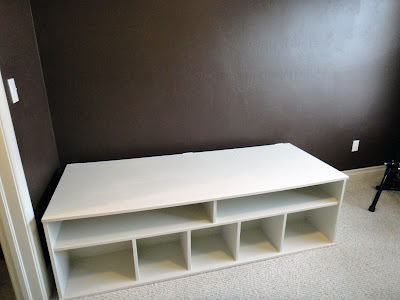 With the transformation of the closet into a home office and displaced items moved into the accompanying playroom/workout room, I decided to add a storage bench- wide enough to upholster a cushion and use as an extra sleeping and/or lounging space. I ordered these Macbeth Collection storage cubes/boxes from HauteLook for my laundry closet, and they just so happened to be the perfect fit for the storage bench. Seemed like it was meant to be. I looked into a custom cushion for around $120, but then my mom mentioned Costco had tri-fold sleeping mats for $50. The brown microfiber cushion measures around 74" L x 36" W for a little overhang on all sides. The back of the bench against the wall needs to be pulled away from the wall to allow for the lid to hinge open, so that overhang is preferred. 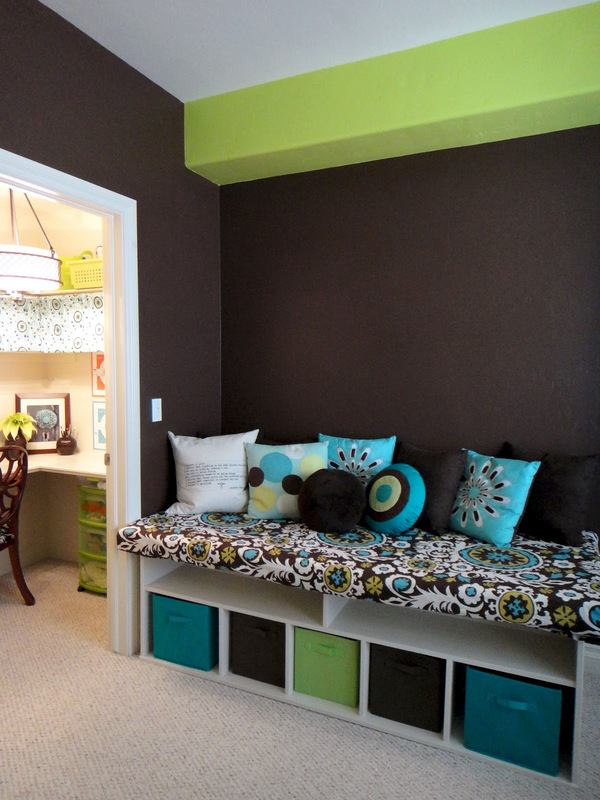 4 chocolate microfiber pillows from Target for $22 + chocolate cushion + chocolate wall = dark and blah. 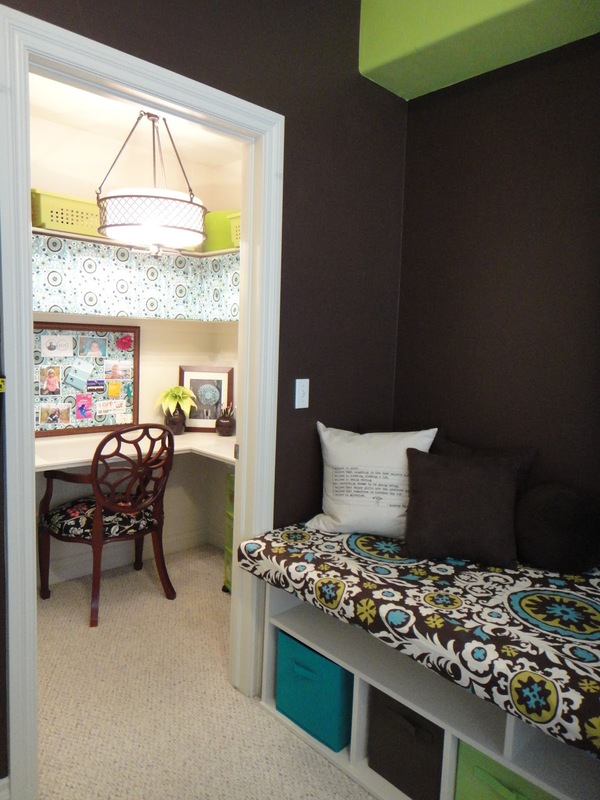 The storage bins are pretty and a perfect fit, but that doesn't make them the perfect fit for this location. I added two turquoise 12" bins for the 16" cubbies, 2 chocolate and a lime 11" bin for the 3 middle 12" cubbies. I relocated extra pillows from the kids beds (which are typically off the kids beds anyway). I always like when one project morphs into several others. Want to see how I finished the chocolate brown wall? Click here for the room update. 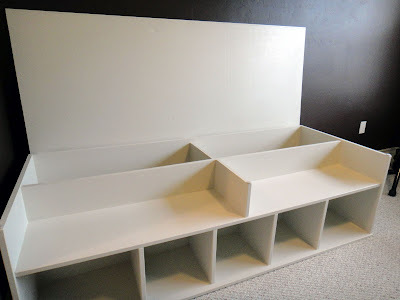 I LOVE this storage bench! I love all the colors too. My husband wants to do a dark chocolate wall and I didn't want to. You may have changed my mind. I'd love it if you'd share this at my link party. Love all the bright colors! I like your idea of repainting the wall, I think it will look great! I found you via the UBP12. 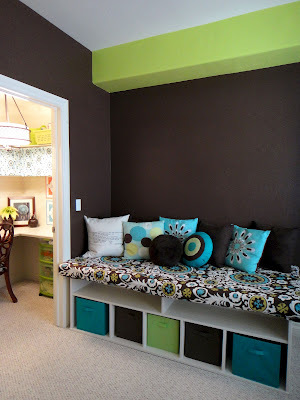 I love the storage bench idea. I like multi-use items especially if it serves those purposes well. I have never built my own furniture (like the storage bench). Did you paint the pieces first before putting it together? Is it nailed and glued? What tools did you use to make it? How long did the process take? Any resources you'd recommend? Thanks. 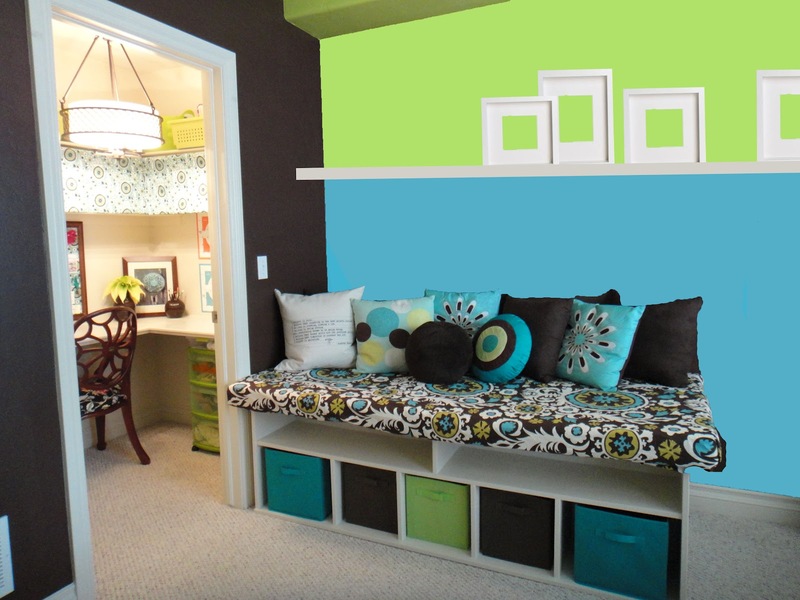 Where did you get your turquoise storage bins? Dorsa, the turquoise bins were from the Target dollar section for $2.50 around the time of the original post. Did you build the bench yourself? This is fantastic!